A previous performance of ‘Muktidham’. Abhishek Majumdar’s Muktidham is an intellectual argument. But don’t let that dissuade you from watching it, because it is also a brilliant work of performance, set design and linguistic gymnastics. 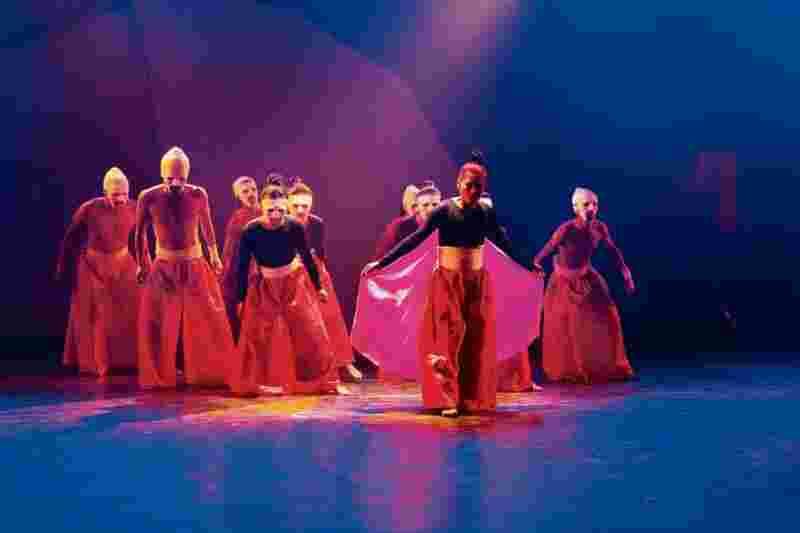 The play, among the 10 nominated for the Mahindra Excellence in Theatre Awards (META) this year, is a robust gaze at part of India’s religious history. In Hindi that amalgamates Sanskrit, Pali and local tongues, Majumdar and his cast of actors take us to the north India of the eighth century, when Buddhism challenged entrenched ideas of Hinduism. The team creates the ascetic yet formidable world of a matha (Hindu monastery). Its head, Nath Nand, who is about to retire, faces a dilemma: Which of his disciples should succeed him—Yuyutsu, who believes in reform and opening the doors of the temple to the lower castes, or Agnivesh, who believes in armed resistance against Buddhism? As the story unfolds, with the characters detailed rigorously, with their ideologies and insecurities, the intellectual argument is cemented. Two worlds open up: of the educated Brahmin supremacist who feels his faith and world view are under threat, and the lower-caste “sinner" whom Majumdar’s writing endows with a breezy sense of humour. The play’s relevance to modern India’s ideas about nationalism is obvious. In February, Majumdar and his mammoth crew travelled with the play to five cities and towns in Uttar Pradesh—Lucknow, Agra, Allahabad, Bareilly and Gorakhpur. The playwright-director says it was the most interesting tour in the play’s journey, which started in 2017 in Bengaluru. “I could feel that in these cities, the audience actually followed the argument more than the plot," he says. Majumdar conceived the play in 2015-16, when authors and artists started returning their awards as a protest against being labelled “anti-national". “Historically, all right-wing politics has an anti-intellectual root. With this play, I wanted to visit a time and milieu in which there actually was a literal threat to Hindu supremacy, and found that even then, it couldn’t hold intellectually," Majumdar says. Majumdar, based in Bengaluru, writes in Hindi, Bengali and English, and is one of the few multilingual playwrights in the country. His Kashmir series—Rizwan (2010), The Djinns Of Eidgah (2013) and Gasha (2013), which won three METAs in 2013—and the recent Pah-La about contemporary Tibet, are overtly political works. Muktidham, however, stands out with its unflinching portrayal of a past that has uncanny parallels with the present. The META-nominated plays will be staged from 13-18 April, at Kamani Auditorium and Shri Ram Centre, New Delhi. For details, visit Metawards.com. A still from Comfort Women. An adaptation of Bertolt Brecht’s play, ‘The Caucasian Chalk Circle’. A dance-drama based on Dravidian mythology of the union of ‘prakriti’ (female) and ‘purusha’ (male). A Christian priest takes inspiration from goalkeeper, René Higuita, when he has to save a tribal girl from a predator. Inspired by Korean “comfort women", this story is about an Assamese village girl’s struggle to survive the brutality of the Japanese army during World War II. This Greek tragedy is an interpretation of the story of Jacosta, a mother torn between two warring sons, and the downfall of the city of Thebes.